After 3 years of development, and many hours of rigorous testing, Reliable Controls is pleased to announce the official release of the MACH-ProCom™ BACnet® Building Controller. Units officially began shipping on Wednesday, June 13, 2007. The MACH-ProCom™ is a sleek and powerful 32-bit based BACnet® device that delivers unprecedented value in a high performance building controller. The MACH-ProCom™ provides high speed 10/100 Ethernet, SMART-Net communications, expandable I/O, and protocol support for BACnet®, RCP, SMTP, and Modbus RTU and TCP (both master and slave). The MACH-ProCom™ controller database allows users to define up to 160 universal I/O on a single address. The MACH-ProCom™ building controller is the first in a series of devices to be developed in the MACH-Pro line of BACnet® Controllers from Reliable Controls. In the coming months, look for the release of the MACH-ProSys™ controller and MACH-ProPoint™ I/O expansion module. The MACH-Pro™ Series and the entire MACH-System™ is available for purchase through Reliable Controls Authorized Dealers. 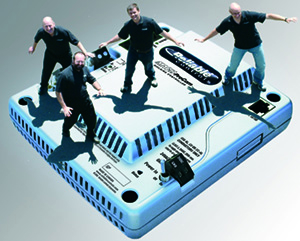 Please visit www.reliablecontrols.com to locate a dealer near you.